One week and a day after Lorraine and Stanley Garland died, Foxboro and the surrounding area got hit with a violent Nor’Easter, and most of the town lost electric power for a few hours. Driving through the dark streets that Sunday night, the hurricane-force wind and rain blasting my car, I thought about what a metaphor it was for what has happened to us — the light was gone. The world felt much colder, much darker, like hope had been extinguished. Lorraine and Stanley’s death has shaken me to the core. I’m trying very hard to make sense of it and I can’t. I don’t understand why two of the best people I’ve ever met in my entire life, two of the most giving and loving individuals, two people who defined community service and selflessness, are no longer with us. I haven’t accepted this nightmare yet; the reality hasn’t hit, and I suspect Is true for most of us. I just can’t stop thinking about Lorraine and Stanley. You all know the Garland’s extraordinary résumé of community services, kindness and compassion. There really is no adjective, no superlative that accurately describes how kindhearted and generous they were. I first met Lorraine around 1993. My wife Sue was conducting food drives for the food pantry, and she asked me to give a flyer to someone named Lorraine Garland, who I soon met in the cramped quarters of the Lewis school that served as the senior center back then. I remember I immediately liked Lorraine. She smiled a lot, even when she wasn’t smiling. She had an air about her of genuine kindness. It was obvious that she cared for and loved the seniors. I soon saw that she was the lifeline for the seniors. A few months later, I helped out at one of the seniors “Strawberry shortcake summer sizzlers” at Saint Mary’s Hall. The show was a fund-raiser for the Council on Aging’s “Van-Go,” and was a tremendous success. That’s when I met Stanley, who was quietly serving coffee and shortcake, and helping move tables. Then there was a holiday food pantry drive. I remember calling Stanley, and he came to Stop & Shop to help us load one hundred and four bags of food items — nearly double the sixty-four bags collected the previous week that he also helped carry. At the time, there was no room anywhere to hold so much food, so we loaded the bags in Stanley and Lorraine’s garage. They later sorted the food and then trucked it back to the food pantry. Stanley was always there; it didn’t matter what the event was, what the cause was. If Lorraine was involved, Stanley was right there. Quiet, behind the scenes, very humble, just a really good guy. For all that Lorraine accomplished, credit must be given to Stanley as well. He was her rock, her soul mate, and her “right hand man” as she once called him. He supported every endeavor Lorraine set out to accomplish. Like his wife, he was quiet about it, always placing others above himself. I recall one Christmas, looking at the more than 200-plus plastic bags of toys for needy children that filled their house. Stanley talked to me about how he wished Lorraine would slow down a little, let someone else take on some of the chores of this huge project, but he knew she never would. He joked that he and Lorraine didn’t get much sleep in November and December, focusing all their free time on the food deliveries, senior Christmas fair, toy delivery, food pantry, and so much more. Lorraine even related a story of how she personally had cooked and delivered a turkey dinner for a family who hadn’t known about the food delivery in time. As I got to know them, I learned that the seniors were Lorraine’s passion, and she, along with dear Jerry Rodman, had a dream — the construction of a Senior Center on Central Street on land donated by the town. The seniors had been shuffled from place to place for years, and faced another move that year. The seniors had no place in town to call their own. Besides Lorraine and a part time secretary, COA had no staff, and relied on volunteers for assistance with day-to-day operations. Lorraine doubled as the custodian and she and her assistant single-handedly ran an office in what was obviously a burnout job. Lorraine clocked 50 hours a week but worked many evenings and weekends and was constantly on call. Much of the COA office furniture and equipment was donated or salvaged. But Lorraine’s spirits never dampened, despite so many obstacles and the months when it seemed like the idea of a senior center was impossible. The COA, and the Friends of Foxboro Seniors, directed by Lorraine, consisted of many tireless, generous volunteers who consistently gave their time to help Foxboro’s seniors, but Lorraine was the coordinator. She was the catalyst. She got things done. While others began to doubt a senior center could be built, Lorraine and Jerry were undaunted. In 1996 there was talk of COA’s budget being cut. I remember the zeal in Lorraine’s voice as she spoke at the meeting about the importance of the COA, detailing many of the services they provide to the seniors throughout town. Lorraine loved her seniors so much. We were once talking about the new Van-Go for an article I was writing, and she told me it was purchased with the senior’s fund-raiser money and not donated, like in other towns. It was a point Lorraine wanted to be sure everybody understood clearly. “I’m so proud of the seniors,” she beamed back then. “They fund-raised for five years for the new Van-Go. It was constant fund-raising, constant.” She continued, “We’re the only town in the state that had to buy their own van,” relating a story of how the town of Plainville had got the State to buy their new senior van. I remember talking to Lorraine about the future senior center. She told me that for her, the act of actually standing on the Central Street site brought tears to her eyes. While many people had a hand in lobbying for the senior center, make no mistake; it was Jerry and Lorraine who made it happen. They worked tirelessly for months. One time Lorraine told me she’d completed a 236 double-paged grant application in about two and one half weeks — very impressive, considering it was a process that normally took a year. All that hard work by Jerry, Lorraine, Stanley and so many volunteers came to fruition on that beautiful summer day when Lorraine and Jerry cut the ribbon officially dedicating the new senior center. It was joyous. A dream come true. Today, that modern and beautiful building is the home of COA and Foxboro Human Services. It’s a lively place, with a full staff and countless volunteers, and a place so many seniors call their second home. While other people have fought for this senior center and are now helping to build it, it’s you — it’s always been you — who has fought longest and hardest, when no one else believed it could be done, and you alone made sure the dream never died. People were on their feet cheering Lorraine that day. She was their hero. I grew to love Lorraine dearly; there was such a light about her. She had such a warm presence, so kind. She took the time to listen to everyone who spoke with her. She’d help any way she could. You never felt as though you were bothering her. She even made time to send out thank you notes to the many volunteers who helped in every event. At every food basket assembly, the first thing she did was thank the volunteers for their assistance. It was through Lorraine that Sue and I became involved with the Food Pantry. I remember Lorraine at our door later that summer. She and Stanley had recently been vacationing in Maine, and they’d purchased a beautiful hand drawn bird scene for Sue, which Lorraine had hand-framed. Theirs were lives worth emulating. A happy, well adjusted family, an obviously loving and happy marriage, and hearts of gold that reached beyond themselves. And somehow they made it look easy. Somehow they made the time. Lives so very, very well lived. 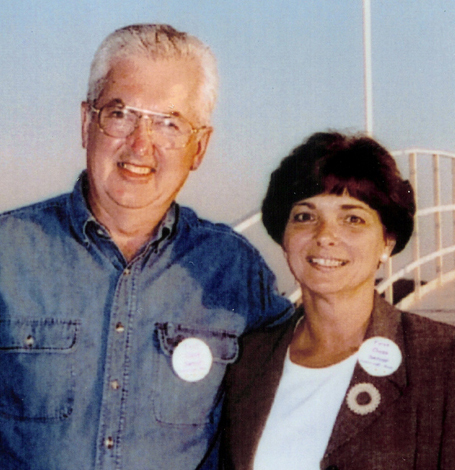 During the funeral, Jack Authelet described Lorraine and Stanley as laying down stepping-stones. In countless ways, Lorraine and Stanley paved the way, cleared the path, and shined the light for the rest of us. Now it’s important that we continue down the path they have started, laying new stones. Continuing to help others. Continuing to remember their example. We are truly blessed in Foxboro. Blessed by a great sprint of service to others. There are many others, like the Garlands, who give tirelessly of themselves. There are many groups and individuals that help the community in countless ways. We are a family-oriented community. The good work will continue. I’m grateful I knew Lorraine and Stanley. I’m thankful that they were such an influence on my life and we’re all grateful for the wonderful things they accomplished, the love they shared, and the stepping stones they laid down for us. I’m thankful they chose Foxboro as their home, and how they made such a positive difference in the lives of everyone they met. Our generation tends to pick athletes and celebrities as our heroes. But the true heroes are people like Lorraine and Stanley. They were my heroes. They still are. I pray that their children Skip, Wendy, Lisa, and the Garland and Ashe families take some comfort in knowing how unique and cherished their parents were, and how much we as a town loved them. Thank you, Lorraine and Stanley. Thank you for all you have given us, and the love you showed us. We love you. We will never forget you. God bless you both, may you rest in peace. Foxboro 2016: The dog park is back!